We’d love your help. 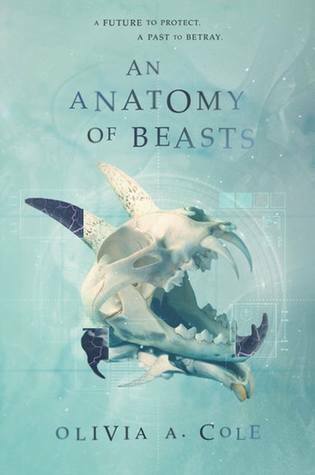 Let us know what’s wrong with this preview of An Anatomy of Beasts by Olivia A. Cole. In the forty years since the Vagantur landed on Faloiv, the planet has existed in a tenuous peace between the humans who live in the enclosed community of N’Terra and the Faloii, the indigenous population. But after uncovering the shadowy secrets of the Council’s newly elected leader and helping a kidnapped Faloii man escape, sixteen-year-old Octavia knows that conflict is In the forty years since the Vagantur landed on Faloiv, the planet has existed in a tenuous peace between the humans who live in the enclosed community of N’Terra and the Faloii, the indigenous population. But after uncovering the shadowy secrets of the Council’s newly elected leader and helping a kidnapped Faloii man escape, sixteen-year-old Octavia knows that conflict is looming. Her discovery of a separate population of humans—including her grandparents—only serves to show her how out of touch humans are with reality on Faloiv. To ask other readers questions about An Anatomy of Beasts, please sign up. Does anyone know how many books are going to be in this series? OH MY GOSH LOOK AT THE COVER I'M SCREAMING HOW DID THIS SERIES GET EVEN MORE GORGEOUS??? but like, can we talk about this cover tho?? I'm so excited for this! Everything I loved about A Conspiracy of Stars was only further developed in An Anatomy of Beasts. If you love books with rich world building, Cole delivers a stunning planet not only full of lush plants, but descriptive animals. It's like walking through a virtual off planet zoo! Not only that, but An Anatomy of Beasts asks us what we will do to fight for our home. Where we will take our stand. It's about having to think for ourselves in a world, a society, that wants to deceive us. My Review: I loved how book one unfolded and the story was just a great blend of new creatures and characters and a world unlike any other. This one was even better than book one. I enjoyed how the pacing picked up just a little and all the characters are still with us. Without giving anything away I will tell you that if you think you know where this book is heading you have NO CLUE!! I loved every page of this title and I really hope we get another one after this!! I love this world and in the My Review: I loved how book one unfolded and the story was just a great blend of new creatures and characters and a world unlike any other. This one was even better than book one. I enjoyed how the pacing picked up just a little and all the characters are still with us. Without giving anything away I will tell you that if you think you know where this book is heading you have NO CLUE!! I loved every page of this title and I really hope we get another one after this!! I love this world and in the end I would love to see another story about where everyone else ended up since of course these people were stranded here. This could be one of those series that encompasses so many things and I hope the author does that!! As I don't want this to end. So I have to say I am in love with the world that Olivia A Cole has created. The world of Faloiv is amazing, and the way the world communicates is so cool (and one of my favorite parts about these books). But not only that, the plants and animals that she has created are unique and not just by how they look but in their relationships and reactions to each other. I also love how the main character grows in this book and how she is discovering things about herself and her strengths that she did not So I have to say I am in love with the world that Olivia A Cole has created. Woooooow. I loved A Conspiracy of Stars but this sequel is on a whole other level of great. I just finished it and I am already planning to recruit friends and coworkers to pick up copies and share my love and frustration. (29/06) All the blue cover reveals (this, King of Fools by Amanda Foody, Honor Bound by Rachel Caine and Ann Aguirre) got me suspicious. Nevertheless, this might be the most gorgeous one of the three. First, I did not know this was a second book in a series so I don't know anything about the first book other than what was referenced in this book. Second, I really loved this book and got exactly what I was expecting. If you want to know more about my thougths on this book, check out my reading blog. Olivia Cole is an author and blogger from Louisville, Kentucky. She spent eight years in Chicago and two in South Florida before finding her way back home. She is the author of PANTHER IN THE HIVE and its sequel, THE ROOSTER’S GARDEN, as well as her latest young adult series, A CONSPIRACY OF STARS and its sequel AN ANATOMY OF BEASTS. She is on the Creative Writing faculty at the Kentucky Governor’ Olivia Cole is an author and blogger from Louisville, Kentucky. She spent eight years in Chicago and two in South Florida before finding her way back home. She is the author of PANTHER IN THE HIVE and its sequel, THE ROOSTER’S GARDEN, as well as her latest young adult series, A CONSPIRACY OF STARS and its sequel AN ANATOMY OF BEASTS. She is on the Creative Writing faculty at the Kentucky Governor’s School for the Arts and is the founder of the sci-fi art show for young Kentucky women, KINDRED: MAKING SPACE IN SPACE.